letter from The Harper Family, August 1, 2003 with updated photo of Jack in 2012! 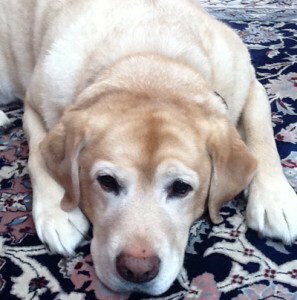 We are very thankful that you were able to help Jack, our yellow lab, come out of his comma. As you are aware, he ate 4 or 5 mushrooms and lapsed into a comma and was put on life support. Poison Control predicted that after 12 hours he would probably not wake from the comma. We are absolutely convinced that because of your intervention during his comatose state that you helped him understand that his family needed him to wake up. Within 2 hours after you started working with Jack he took a breath on his own. After 22 hours in a comma, Jack woke up!!!! We are very thankful to have our sweet dog back sleeping on our bed and greeting us each morning when we awake. Your ability to reach out to animals as a psychic is such a special gift. We appreciate your help in communicating with Jack. You brought him back to us! Many, many THANKS!